The Iraqi government forces have taken full control of Kirkuk, Al Jazeera and Sky News Arabia report, citing the central government in Baghdad. The Iraqi Prime Minister Haider al-Abadi’s has ordered to raise the Iraqi flag over the city and other Kurdish-controlled areas. The “attack” on Kurdish-controlled Kirkuk by Iraqi troops is “a flagrant declaration of war against the nation of Kurdistan,” the Peshmerga General Command said in a statement earlier, as cited by Rudaw. The Peshmerga described Baghdad’s move as “retaliation against the right of the people to vote on their fate,” referring to last month’s referendum on Kurdistan’s independence, in which 92.7 percent voted to secede from Iraq. The Monday developments reveal a split in Kurdish factions, as some of the militias were reported to leave Kirkuk without a fight amid reports of clashes between the Iraqi Army and the Peshmerga. Iraqi Prime Minister Haider al-Abadi earlier said the operation was aimed at protecting the unity of Iraq following Kurdistan’s independence vote. “It is my constitutional duty to work for the benefit of the citizens and to protect our national unity that came under threat of fragmentation as a result of the referendum that was organized by the Kurdish region,” al-Abadi said in a statement. Kurdish leader Masoud Barzani ordered Peshmerga forces to not attack the Iraqi military first, but gave a “green light to use every power” to fight against the advancing forces, according to Hemin Hawrami, a senior assistant to Barzani. “Coalition forces and advisers are not supporting Government of Iraq or Kurdistan Regional Government activities near Kirkuk, but are aware of reports of a limited exchange of fire during predawn hours of darkness October 16. We believe the engagement this morning was a misunderstanding and not deliberate as two elements attempted to link up under limited visibility conditions,” the coalition said in a statement. Hundreds of people in Kirkuk took to the streets to celebrate the takeover of the city by Iraqi government forces. A video posted on social media shows a group of people with Iraqi flags greeting government troops in front of the city’s governorate building. The majority of demonstrators are reportedly of Arab or Turkmen origin, while thousands of ethnic Kurds fled the city alongside the Peshmerga forces. Some ethnic Kurds, however, also appear to be welcoming the government troops. Immediately after the Iraqi forces made their Kirkuk move, conflicting reports began coming in about the Kurdish-controlled oil fields and facilities in the region. Media reports indicate two oilfields – Bai Hassan and Avana – shut down production. The reports were followed by indirect threats from Baghdad. Iraqi forces could be deployed “in a very short time” to regain control over Kirkuk oilfields and restart oil production, a senior Iraqi oil official was cited by Reuters as saying. “We will not allow them to shut down production. We’ve got confirmation from military commanders that it’s a matter of a very short time,” the official said. Earlier, a spokesman for North Oil Company said the oil ministry had warned the Kurdish authorities against any action “that would cause crude oil flow disruption from Kirkuk oilfield.” The company has asked the central government and oil ministry to deploy “security forces to intervene and prevent Kurdish crews from mismanaging production,” according to the spokesman. Israel’s supposed support to Kurdish “independence” is a poison pill, the sincerity of which is belied by Israel’s ongoing war against Palestinian self-determination. The author’s statement is inaccurate. Kurdish leaders in Turkey and Syria, at least, have stated that they are not engaged in a fight for Kurdish independence but rather for federalism (or call it regional autonomy). As well, the author fails to mention that the Russian government has long voiced support for federalism in Turkey and Syria. It is the only major government involved in the conflicts in the Middle East to voice support for political self-dtermination for the Kurdish people. 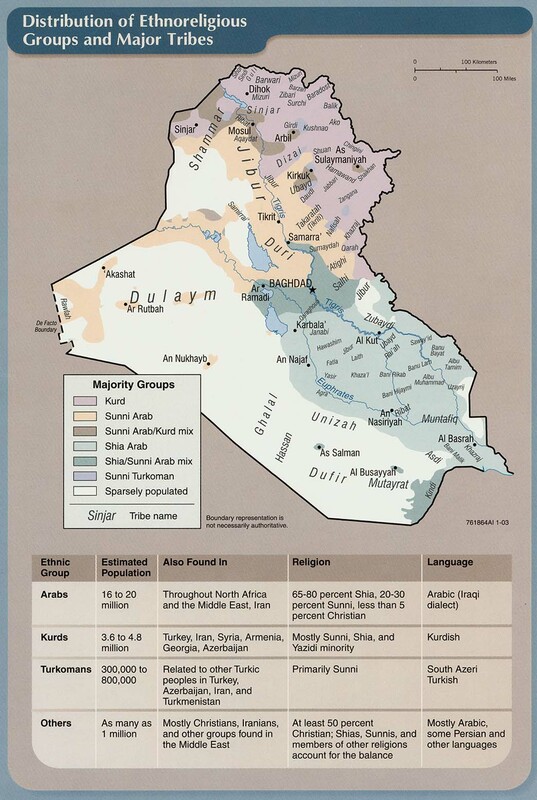 Last month’s Kurdish independence referendum in Iraq has inspired some of Iraq’s Sunni leaders to call for their own autonomous state in its Sunni areas. KIRKUK, Iraq — After weeks of threats and posturing, the Iraqi government carried out a military assault on Monday to curb the independence drive by the nation’s Kurdish minority, wresting oil fields and a contested city from separatists pushing to break away from Iraq. The deadly clashes pitted two crucial American allies against each other, with government forces seizing Kirkuk from Kurds who had intended to build a separate nation in the northern third of Iraq. The Kurds voted overwhelmingly for independence from Iraq in a referendum three weeks ago. The United States, Baghdad and most countries in the region had condemned the vote, fearing it would fuel ethnic divisions, lead to the breakup of Iraq and hobble the fight against the Islamic State. Iraqi government troops and the Kurdish forces, known as pesh merga, are both essential elements of the American-led coalition battling the Islamic State, also known as ISIS or ISIL. Both forces are supplied and trained by the United States. Despite the resounding success of the referendum, Iraqi forces were able to take Kirkuk in a single day and with little fight, partly because it is a multiethnic city of Kurds, Turkmens and Arabs, and partly because the Kurds themselves were divided. Baghdad had forged an agreement with the Kurdish faction that controlled most of the strategic points of Kirkuk, allowing government forces to sweep into much of the city without firing a shot. But skirmishes with another Kurdish faction left nearly 30 dead and dozens wounded, according to local hospitals. As Iraqi troops rolled into this city of about one million, Arab and Turkmen residents fired weapons into the air in celebration. Cheering crowds looked on as Iraqi forces removed a Kurdish flag that had flown over the Kirkuk governor’s compound and left intact an Iraqi flag mounted beside it, local officials said. Iraqi troops drove through the city, removing pesh merga flags and banners and replacing them with Iraqi flags. While Iraq’s future remains far from secure, the momentum has clearly swung in Baghdad’s favor. Its forces have now beaten back existential challenges on two fronts, pushing the Islamic State out of major cities and retaking a critical oil region from the Kurds. Neither battle is over. But the Islamic State, which three years ago controlled a third of the country, has been reduced to a handful of desert outposts and a small city on the Syrian border, while the Kurds may now have to defer their independence dreams. The referendum, which had Kurds celebrating in the streets three weeks ago, has now clearly backfired. The Kurdish region depends heavily on oil revenue, roughly half of it from the Kirkuk region, and the independence vote alienated the United States and angered neighbors. “They may have made a miscalculation of historic proportions by proceeding with the referendum over the objections of just about everyone who counts,” said Joost Hiltermann, an analyst with the International Crisis Group. The Kirkuk operation also exposed deep divisions within the Kurdish command, as fighters loyal to a Kurdish opposition party, the Patriotic Union of Kurdistan, agreed to make way for the advancing Iraqi forces even as other fighters loyal to the governing Kurdistan Democratic Party continued to resist. The Kurdish leader Massoud Barzani spearheaded the referendum, which most Kurds saw as a historic step toward achieving the national dream of an independent homeland. But critics accused Mr. Barzani of staging the vote to deflect attention from the Kurdish region’s troubled economy and what they consider to be Mr. Barzani’s authoritarian rule. Moreover, and especially irksome to Baghdad, the vote included disputed territory outside the boundaries of the autonomous Kurdish region, including Kirkuk and the surrounding oil fields. Kurdish forces seized that territory in 2014 after Iraqi troops fled an Islamic State assault, but Baghdad has never accepted Kurdish control there. In the last few days, emissaries from Baghdad conducted secret talks with Kurdish opposition forces to negotiate their withdrawal. 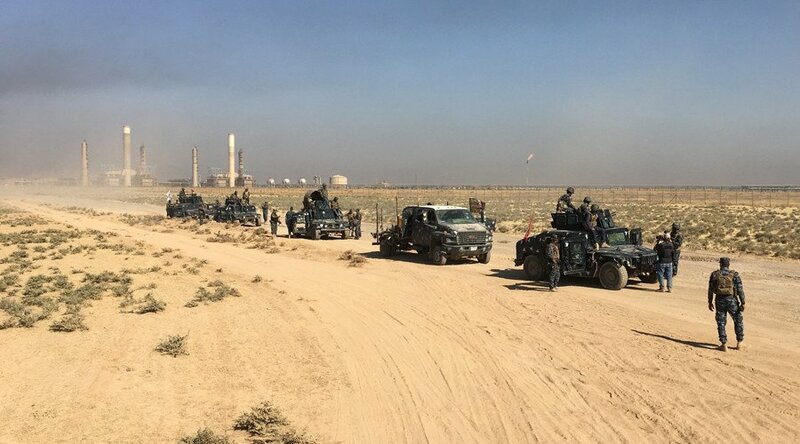 Wista Raool, commander of opposition pesh merga forces south of Kirkuk, said the opposition sought to return the oil fields to the federal government. He accused Mr. Barzani and his party of “stealing” the oil from the Iraqi government. Still, fighting broke out between advancing government forces and pesh merga fighters from Mr. Barzani’s faction. A Kurdish commander, Gen. Mohammed Raiger, said his forces had mounted a counterattack about 15 miles west of the city. He said reinforcements with “sophisticated weapons” had arrived to support Kurdish fighters in the area. A statement by the Kurdish government’s security council said pesh merga fighters had destroyed five American-supplied Humvees used by Iraqi forces, and would continue to resist them. According to reports from hospitals in Kirkuk Province, 22 pesh merga fighters were killed in fighting on Monday, along with 7 Iraqi soldiers. Eleven Kurdish fighters were wounded, as well as four Iraqi soldiers and 54 civilians. While Washington has called for calm, analysts said the United States was content to sit this one out, still fuming that Mr. Barzani had turned down an American offer to preside over open-ended negotiations with Baghdad if the Kurds called off the vote. Analysts said the United States sat back quietly as Mr. Barzani’s position eroded in the face of retaliation by Baghdad, which first ended international flights to the Kurdish region and then cut a deal with his rivals to take Kirkuk. By Monday night, the Barzani government had made no public statement on the day’s events. Officials in Baghdad said the provincial governor, Najmaldin O. Karim, had left Kirkuk for Erbil, the capital of the autonomous region. Mr. Karim could not be reached for comment. He was dismissed by Baghdad earlier this year, but remained in office because Kurdish fighters controlled the city. Military commanders in Baghdad said their troops had taken control of an industrial district on the western edge of Kirkuk, a power plant and refinery adjacent to the oil fields outside the city and a military airport west of the city. Iraqi troops also removed a Kurdish flag from a large statue of a pesh merga fighter that Kurdish leaders had erected at the gates to the city. They raised an Iraqi flag in its place, according to local officials, in line with an order from Mr. Abadi for troops to raise the Iraqi flag in all disputed areas reclaimed by government forces. The big question now is whether forces loyal to Mr. Barzani will fight on or back off. On Monday, his forces remained dug into positions near oil fields northwest of the city that the Kurds have controlled since 2014. A number of Peshmerga were beheaded by Shiite Hashd al-Shaabi militia during confrontations to capture the city of Kirkuk on Monday, according to a Rudaw reporter who witnessed the events. Rudaw’s Hevidar Ahmed reporting from the scene revealed that, among the Peshmerga killed by Hashd al-Shaabi, some were beheaded. Ahmed, who reported on the course of clashes between the Peshmerga and Iraqi forces, said that in the beginning, the Peshmerga put up a fierce defense. But the Hashd al-Shaabi widened their advance, at which point many Peshmerga were wounded and killed. He saw the bodies of as many as 10 Peshmerga piled into the back of a pick-up truck. They had all been beheaded. Wounded Peshmerga were put into another vehicle. He said the Peshmerga were beheaded by a group of Hashd al-Shaabi trained after the Mosul operation started last year. Inside Kirkuk, Hashd al-Shaabi have set up security checkpoints inspecting civilians. Ahmed said he saw instances of supporters of the Patriotic Union of Kurdistan (PUK) being permitted to pass, but others linked with the Kurdistan Democratic Party (KDP) were disarmed and insulted. Ahmed also said there were looting and burning of Kurdish homes in Tuz Khurmatu by the Hashd al-Shaabi. He reported that 150 Kurdish houses were looted and 15 burned. He added the bulk of Kurdish families from Khurmatu had fled to Erbil and Sulaimani. As an eyewitness, Ahmed said much of the frontline was abandoned by the Peshmerga without a fight.